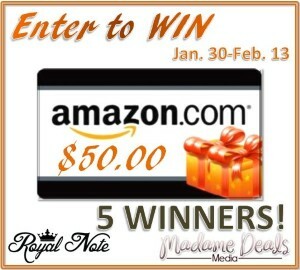 Madame Deals Media has joined up with RoyalNote to bring you this Awesome Giveaway!! We’re giving Away (5) $50 Amazon Gift Cards!! Everyone loves Amazon Cards. Be sure to sign up for RoyalNote and get your chance at winning. RoyalNote is a fun site, where you can earn discounts on products you love, just by answering easy questions. The more questions you answer the more discounts you earn. Easy discount shopping all on one site! RoyalNote is an INVITE ONLY site so Money Saving Michele fans can click on this link —–> RoyalNote in order to register. Register now and then head into the Rafflecopter to complete your entries. RoyalNote is offering expedited access to their invite only service, exclusively to our readers. RoyalNote is a great way to receive substantial discounts from national brands, without having to pay a cent. So how does RoyalNote work? RoyalNote will feature one of their brand partners through flash promotions, and notify you by email and/or social media. The promotions are in the form of a short multiple choice survey, which allows you to provide valuable feedback (anonymously) to the brands. Answer the first question, and receive a discount from the brand. If you choose to answer the next question, you’ll receive a bigger discount. Keep answering the questions until you’ve completed the survey, and you’ll end up with a substantial discount. The brands appreciate your time and feedback, and convey this to you through the issuing of these discounts. You do not have to be the only one to reap the rewards from the brands. Once you’ve claimed and secured your discount, share the experience with your family and friends. Not only will they appreciate the gesture, you can earn additional Royal Dollars (a virtual currency used within the RoyalNote site) that can be used to redeem gift cards offered through the RoyalNote Gallery.